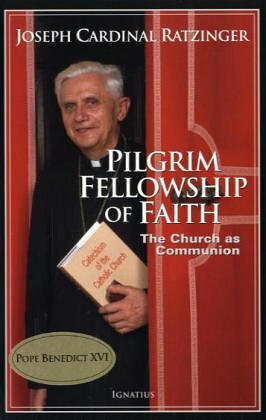 'Pilgrim Fellowship of Faith' is a collection of past writings of the newly-elected Pope on topics such as the ministry of priests, eucharistic theology, non-Christian religions, and the role of the Catholic Church in a secular world. priesthood and began lectures as a full professor of fundamental theology at the University of Bonn. From 1962-65 Ratzinger was present during all four sessions of the Second Vatican Council as a peritus, or chief theological advisor to Cardinal Joseph Frings of Cologne, Germany. . In 1977 Joseph Ratzinger was appointed Archbishop of Munich and Freising and on June 27 elevated to Cardinal of Munich by Pope Paul VI. In 1981 Ratzinger accepted Pope John Paul II's invitation to take over as Prefect for the Congregation for the Doctrine of the Faith and in 1986 he was appointed head of a 12-member commission responsible for drafting the Catechism of the Catholic Church. Cardinal Ratzinger was elected vice dean of the College of Cardinals in 1988. In 2002 Pope John Paul II, approved his election as dean of the College of Cardinals. On April 8, 2005, Cardinal Ratzinger presided over the funeral of Pope John Paul II. On April 19, 2005, Cardinal Ratzinger was elected Bishop of Rome on the fourth ballot of the conclave and took the name Benedict XVI. What in fact is theology?